There are few greater things than starting off a brand new year with a clean slate. One of the best things about the new year is making the good ole check off list of resolutions. However, sometimes it's tough to stick to your guns and make those resolutions actually work the whole year. But, don't worry! We're gonna give you the low down on how to start your day right with the Ultimate Morning Routine of 2018 with MorningStar Farms®! Also, don't forget to download Ibotta for more savings with MorningStar Farms®. Click ​Here for Ibotta Offer. It's the weekend and you know what that means: get your full 8 hours of sleep in! That's right, you finally can feel fully rested and ready for the day without any headaches or weary eyes. Getting rest will help you feel more energetic throughout the day and the rest of the week. So, it's ok to hit that snooze, just not too many times! By far, the most popular new years resolutions is getting in shape. However, it can be one of the most difficult. One way to make sure you stay on track for a better 2018 is to create a workout schedule. This includes THE WEEKENDS. That's right, get your booty moving on the weekends to stay healthier this year. Whether it's a quick jog or a detailed workout plan, spend at least 20 minutes a day, even on your days off. You won't regret it! Sometimes, it's difficult to eat a really tasty and nutritious breakfast on the weekends. Most people want to splurge a little more on the weekends. Fortunately, MorningStar® Farms products are quick and easy and keep you fueled and fit for the new year. 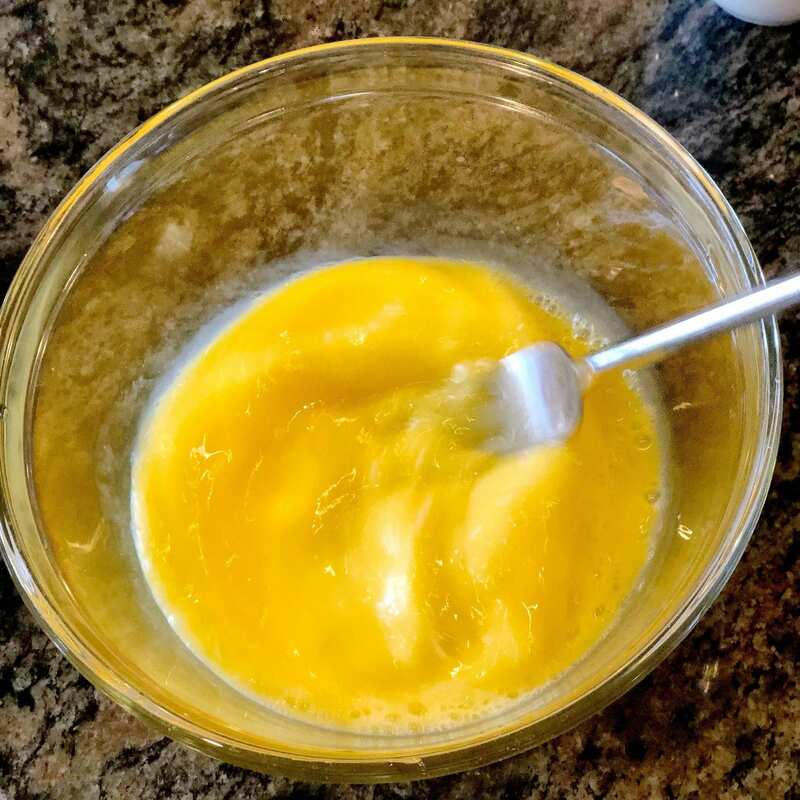 First, I whisked up 3 eggs in a bowl. 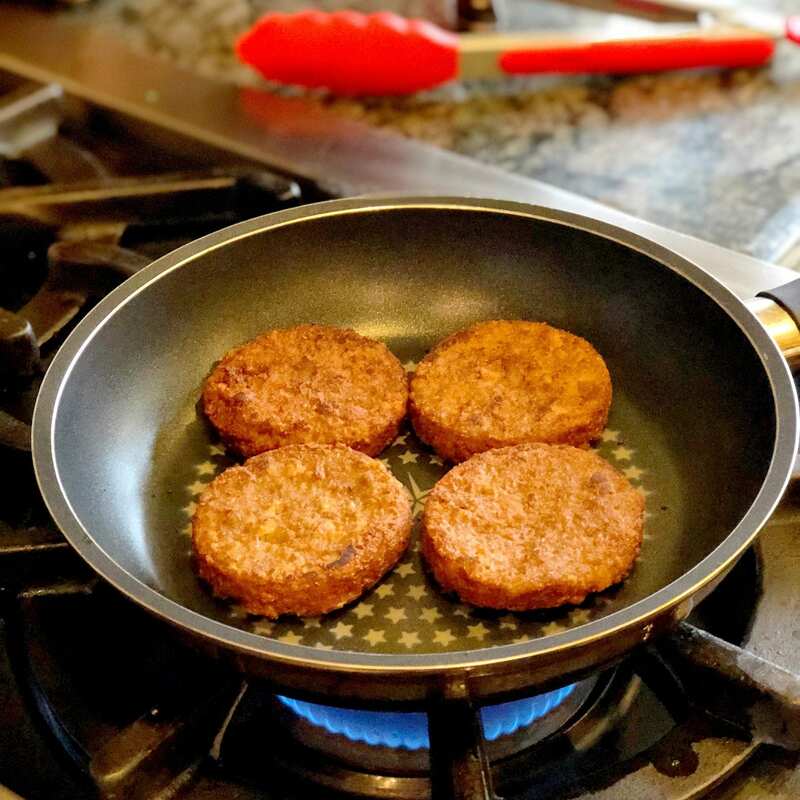 Then, I heated up the frozen MorningStar® Farms Sausage Patties on medium heat in a pan until they were crispy on the outside and warm on the inside. 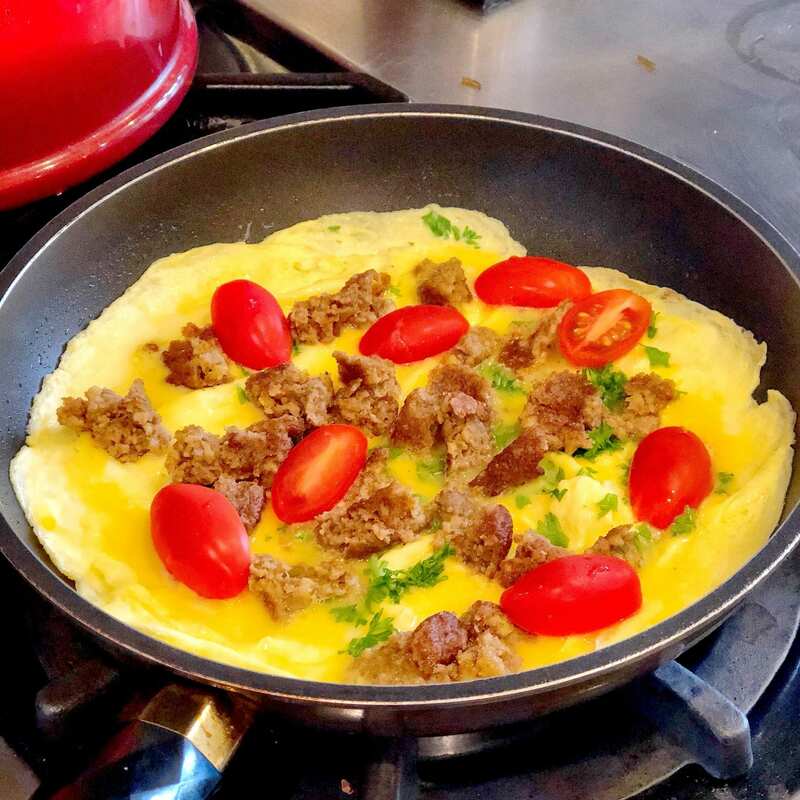 Lastly, I sliced a few cherry tomatoes, scallions, and crumbled the sausage into the cooked egg. I also added reduced fat shredded cheese. It was super tasty and also 100% vegetarian. It was so good my dad didn't even know it was vegetarian! And of course, after you're done with breakfast, enjoy the day! Do something fun and active that will keep you moving and your heart rate going. Once your body is active, you can accomplish anything! It's tempting to push that snooze button. But when you're tight for time, every minute counts. Whatever you do, do NOT press that snooze button. It can risk you being late for a huge meeting, a potential opportunity, or hitting dreadful traffic (and here in LA...well...let's just say there are fewer things worse than that). Instead, try shooting up straight out of bed as soon as your alarm goes off. When you quickly get up, it triggers a bit of an adrenaline rush and better blood flow, making it easier to get up. Have you ever seen a cartoon with your favorite character waking up first thing in the morning with a big stretch? Well, he's doing it right! Stretching in the morning also increases blood flow and oxygen into your system after it's been static for so many hours during sleep. Also, if you've worked out before, it'll feel amazing. Showers are honestly one of the greatest alternatives for alarm clocks. Plus, it will give you a great clean fresh start to your day. However, don't plan on taking too long of a shower. If you quicken your pace and shower around 5 minutes, you will find you'll have more time in the morning to not feel rushed and stressed out. If you're looking for the perfect quick meal to take on-the-go, MorningStar Farms® Sausage, Egg & Cheese Breakfast Sandwiches are the perfect solution for you. These delicious sandwiches are packed with plant protein powder that gives your body the nutrients it needs without consuming meat. It's so good, you'll surely have to "Taste It To Believe It". Not a vegetarian? Not to worry! 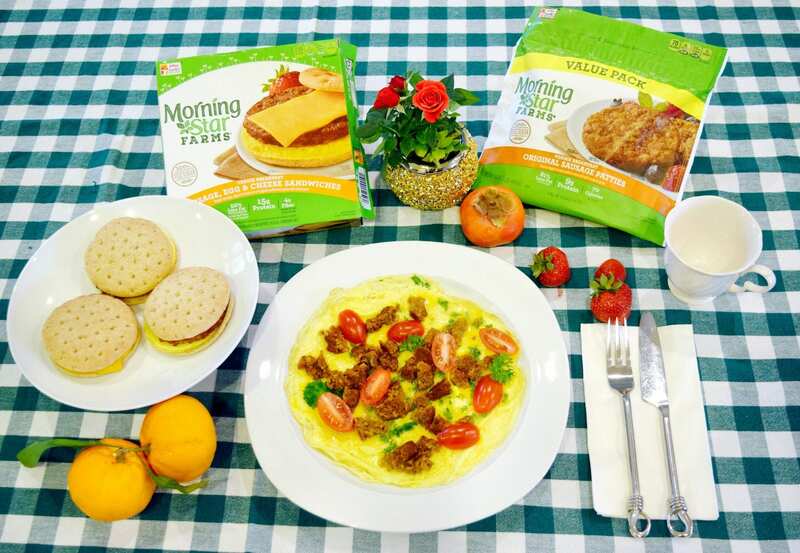 MorningStar Farms® products are for everyone, and taste delicious to all food eaters. Simply pop one frozen in the microwave while you make your morning coffee, and take it on-the-go! You'll love the taste, and they're completely guilt-free. So, if you start your day off right with these helpful tips, you'll find that your new years resolutions will be easier to achieve! 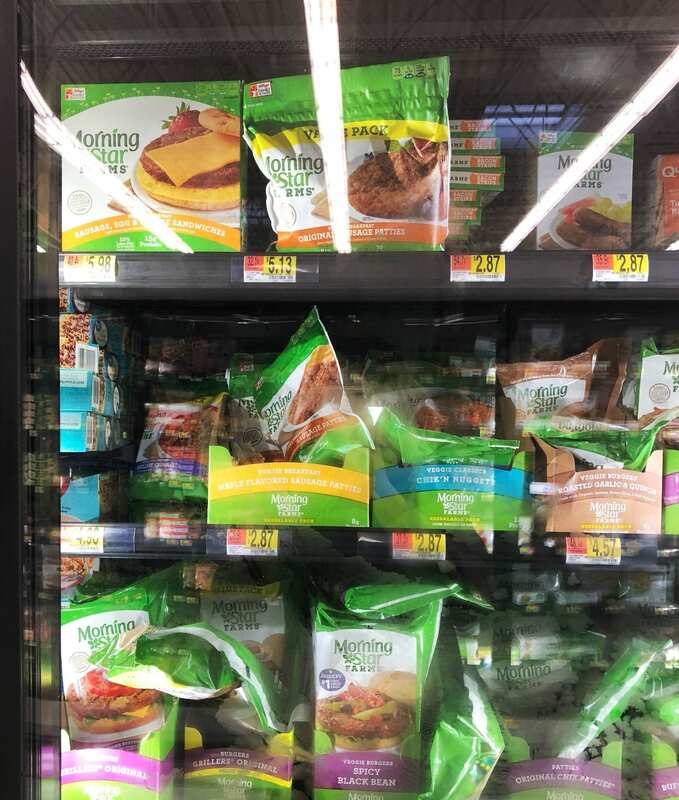 Check them out at your local Walmart in the Healthy frozen aisle. To learn more about MorningStar Farms®, check out their website here. Also, don't forget to check out their Facebook, Pinterest, Twitter, and Instagram!